MOOLOOLABA TO KAWANA: NOT JUST ANY OLD PORT IN A STORM! With the Easter long weekend upon us, locals and tourists alike have been planning which is the best place to spend the country's favourite weekend. If you are looking for safe, shady parks, barbeques, surf beach and play equipment in a beautiful part of the coast, then Mooloolaba is the place I suggest you go. Now the best part about Mooloolaba is that the non-fishing folk can have just as good a time as the anglers with all the recreational areas set up especially for families and large groups. Only a stones throw away are some of the best fishing locations the coast has to offer. As well, there is no fear of missing out on the last snag on the barbeque because all the fishing spots (off the rocks, along the beach and on jetties) are really that close to the picnic areas and parks! Fishing areas in Mooloolaba span from The Bluff to Kawana Waters and Currimundi Creek; the following are my six favourite fishing locations for this area. 1. Starting with the beaches, most of the surf beaches between Alex Headlands and Kawana Surf Club offer good deep gutters and solid sand banks for targeting sand whiting, bream, tarwhine, dusky flathead and dart. On dawn and dusk, the Kawana stretch (between Pt Cartwright and Kawana Surf Club, especially Kawana Pocket) provides a deeper gutter for tailor, jew and the occasional big trevally. Some anglers put in the hard yards and fish through the night for several hours to bring home jew around the 10-12kilo mark - this area is famous for such incredible catches! 2. The Rock Walls and Point Cartwright are both very similar structures but offer two completely different fishing experiences. The rock walls on either side of the bar are easily accessible by car and foot plus boaties can also sit just inside the bar and fish towards the rock walls, knowing they are protected from big swells. Most estuarine species as well as some pelagics move in and out of this channel - best known for big sea bream, flathead, school jew and chopper tailor. Due to the rocks, it is best to fish with lighter tackle and be aware of the direction the water is moving. Bring along the cast net if you are keen but careful - there's usually plenty of baitfish to be caught. 3. Kawana and Minyama Canals are nice deep channels dotted with little bridges, pontoons and jetties which the fish love moving in and out of cover from. The canals have both sand and mud bottoms which attract all the bread and butter species such as flathead, whiting and bream. Baitfish and gar often get trapped and lost in the canal which brings out the hunters like mangrove jacks, estuary cod, golden trevally and jew. Don't forget surface lures - poppers, hard-body prawn look-alikes and colourful metal slugs all work well in the canals for the like of GT's and the occasional queenfish as well. 4. Parrearra Channel is a great all-rounder spot surrounded by rock walls, bridge pylons and jetties which provide the perfect haven for the more timid bream and a perfect lurking spot for our favourite predators - the mangrove jack and jew. Lures and soft plastics work a treat here in the deeper channel where reports of queenfish are common, around the banks near the Loch and off the eastern bank where the water pipes enter the river. The water flowing from these pipes provide plenty of movement in the water causing baitfish to be caught off-guard and over Christmas and the following hotter months, you can often net poddy mullet and prawns for bait here too. It is a great spot to drop the pots for a muddie! 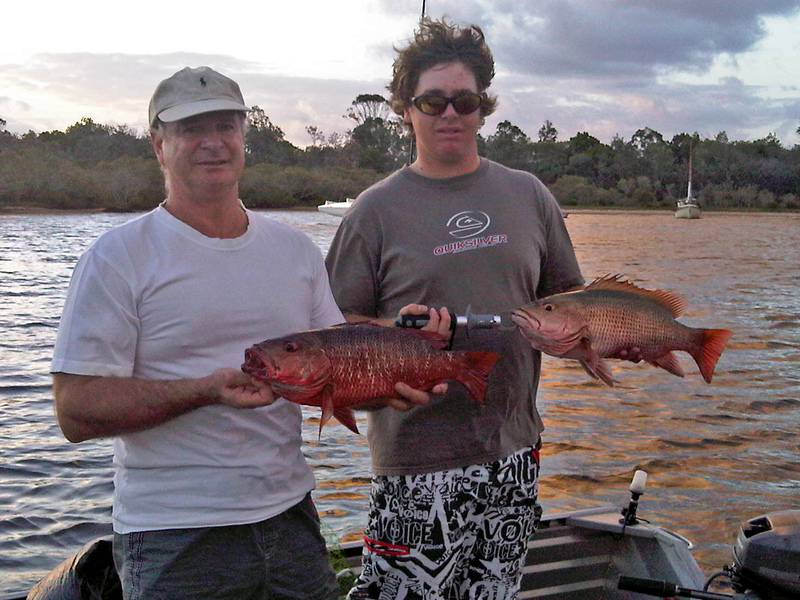 For the younger anglers, I have two great spots in Mooloolaba which are safe to fish and easy to access for the whole family. 5. La Balsa Park is on the southern side of the bar, running from Oyster Point to the Kawana Boat Ramp, with plenty of car parking and grassy, shady parks in the close vicinity. This is a perfect spot for the kids because it is decked out with barbeques and parks and they get a great view of all the boating traffic through the shipping channel, without being too close to lose a whole lot of tackle. Plenty of bream, trevally, whiting and flathead to be caught here, plus an underwater rock ledge near the red channel marker is a known spot for cod, jew and mangrove jacks to bite. Live bait, lures and soft plastics are all very good options to use here. 6. The Wharf Jetties are ideal for kids for several reasons - plenty of seats very close to the decking (where rods can easily sit as though they are in a rod holder), extremely handy for all those treats we love like ice-creams and hotdogs for lunch, well shaded and plenty of parking for the family car. Fishing is best here on the incoming tide for bream, whiting and flathead - fresh prawns, live worms or chicken gut are top baits here. Try using natural brown or orange coloured soft plastics in 1-inch size for bream or up to 3 inches in bright colours for golden and giant trevally on the top of the tide. When it comes to local knowledge on river, beach and offshore fishing in the area it is well worth dropping into Kawana Bait and Tackle at the end of Point Cartwright Drive. Michael and his friendly staff will help you with all of your fishing needs and hopefully put you onto the fish as well. Noosa: Spanish mackerel in good numbers on the dirty water mark on Sunshine. Plenty of quality reef fish in the mirky water on Sunshine. Trevally, tailor and plenty of jacks in Woods Bay. Crabs throughout the middle reaches and canals. Maroochy: Spanish mackerel, long tail tuna to 10kg and grass sweetlip around old women island. Tailor to 3kg from the sand bags and to 1kg in the cod hole on dusk. Trevally and flathead above bli bli bridge. Whiting at cotton tree. Kawana: Bigger Spanish mackerel on troll and sweetlip, snapper and pearl perch on the bottom at the 12 mile reef. Dart, whiting, bream and tarwhine along cuttings 20-40 at Kawana. Bream along the moorings. Mud crabs in the canals. 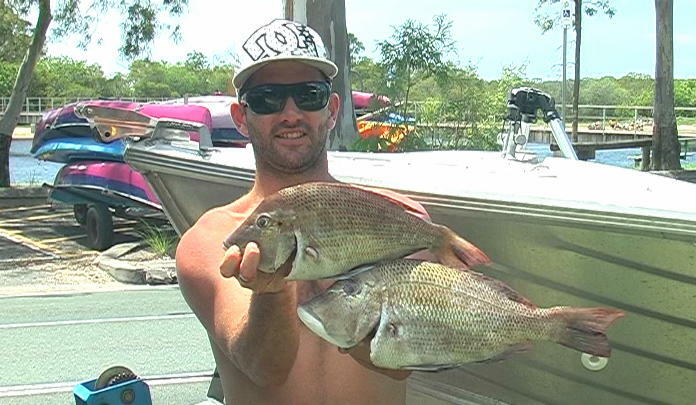 Caloundra: Snapper and sweetlip on plastics around Brays Rock. Bream off the boardwalk. Trevally in Pelican Waters. Mud crabs around the mouths of the creeks. 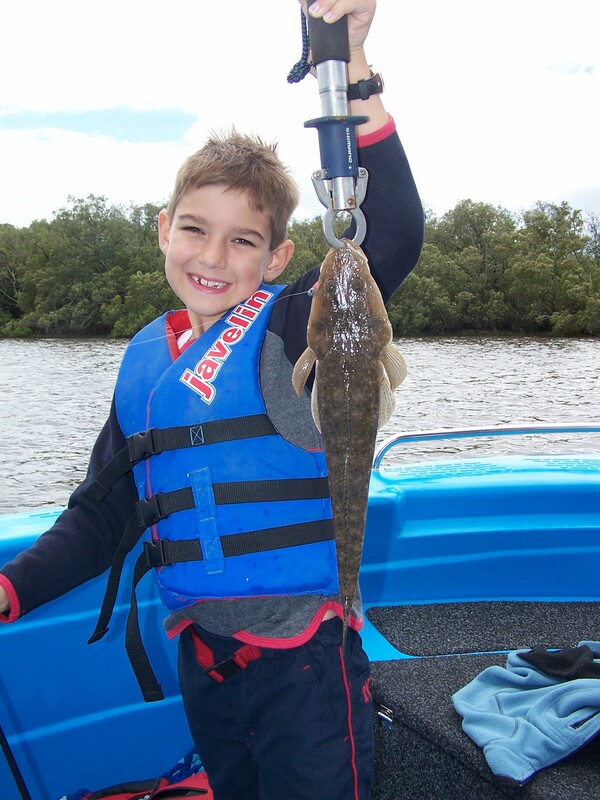 Hunter fished with Anglers Advantage this week working plastics in the upper Maroochy for a pan sized dusky flathead. Father and son team Colin and Ben Gray caught these two mangrove jacks while working the bait boils in the Woods Bays with Storm Chug Bug surface poppers (supplied by www.fishingnoosa.com.au). Jason Armstrong was drifting with slab baits around Old Women Island on Wednesday and came up with several keeper grass sweetlip for his efforts.